Located in Krakow (Stare Miasto), EchoDom 3 Apartments is within a 10-minute walk of Main Market Square and Collegium Maius. A roundtrip airport shuttle is provided for a surcharge (available 24 hours). With a stay at this apartment, you'll be centrally located in Lodz, within a 10-minute drive of Atlas Arena and Piotrkowska Street. Self parking (subject to charges) is available onsite. 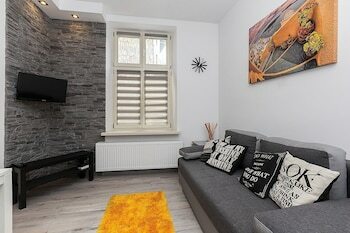 With a stay at this apartment in Gdansk, you'll be within a 10-minute walk of Artus Court and Gdansk Main Town Hall. With a stay at this apartment in Cieszyn, you'll be a 4-minute walk from Museum of Cieszyn Silesia and 7 minutes by foot from Piast Castle Tower. Free self parking is available onsite. A stay at this apartment places you in the heart of Warsaw, steps from Gestapo Headquarters Museum and Lazienki Park.